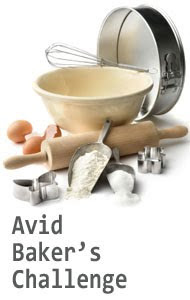 The bake at Avid Baker's Challenge (ABC) for this month is Cinnamon-Swirl Pumpkin Rolls, recipe is from King Arthur Flour. There are many great reviews about these rolls, and I just could not wait to bake them. So much so that I've already baked these rolls more than a month ago. The dough are really easy to work with, and the roll-up are a breeze. I have made my own pumpkin puree, added some dried cranberries in the filling and reduce the sugar filling to 1/2 cup from the original 3/4 cup. When the dough is rolled up to a long log, it is divided into 9 rolls (mine was thicker than the original 1-1/2", perhaps about 2" each). Instructions says to place the 9 rolls in a 9" square pan, but I find that size is a little too small for the huge rolls. So I have placed them in a slightly bigger pan of 10" square, maybe an 11" square would still be OK, because as they are left to rise in the pan, I find that they really puffed! Bake the rolls until they are lightly brown and set. Leave them in the pan on a wire rack for 15 minutes and then remove the rolls to cool completely. The recipe includes a glaze which is to be drizzled over the warm rolls, which I have omitted, as I do not like overly sweet breads. These rolls are sweet enough for me. Overall review : The bread has a moist, soft dense texture. I was expecting a fluffier roll and would prefer it to be more fluffy soft. It does not keep well, and has gone a little drier and stale the next day, best reheated before serving. Even though, this is not in my list of favourite rolls, but it makes a nice breakfast over a cup of hot coffee. For the full recipe, please refer to King Arthur Flour website, here. This was not one of my favorites either. But it was still fun to do. It sounds good with that list of ingredients, but I'm like you, Joyce, in liking a fluffy roll! They look good! :)Hi Joyce , your rolls look yummy , thanks for sgaring "
It sure looks good. Cinnamon rolls one of my favourite. Your rolls look delicious Joyce! I, too, cut back on the sugar in the filling but wish I had added the cranberries for a little more interest. hello Joyce, they loook fluffy and delicious, and they are all so light "yummÿ" / p.s. next time I will make them with cream cheese! Joyce, can I "da bao" some of your pumpkin version of cinnamon rolls? Like this, no need to leave them to the next day. 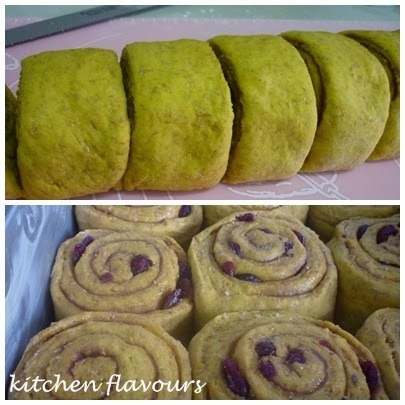 I love it that pumpkin is used in this dough. Yes recipes do not always turn out as expected. They look great, Joyce. Sorry you didn't like them too much. I froze the leftovers and reheated them in the microwave and they were great. Your rolls look very nice, and I wonder how they compare with the cinnamon rolls we did from "The Weekend Baker" last year. Those we really loved. I haven't made this version, yet, because I was visiting my family in Hamburg, so I'm interested how everybody likes them. The over-sweetness is always something to consider, I routinely cut back on the sugar in pastries.